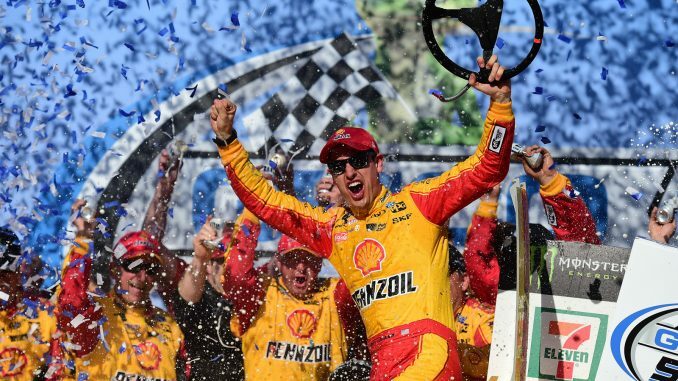 There is an old adage that says the only way to be around at the end of a restrictor plate race is to be way in the back or running up front; Joey Logano chose the latter Sunday leading a race high 70 laps in route to victory in the Monster Energy NASCAR Cup series Geico 500 at Talladega Superspeedway. Logano, who has three wins at NASCAR’s largest track, broke a 36-race winless streak dating back to Richmond last April, a race he won but that was later ruled to be ineligible to count towards the season ending playoffs. Logano would go the rest of the 2107 season without a win and miss the playoffs. His next win came on Sunday. “Obviously a lot of people ask that question millions of times: What happened?” Logano said. “It’s still the same team. Not much has changed. It’s the same core group that’s made two amazing fights to almost win a championship. We stuck together for that reason. 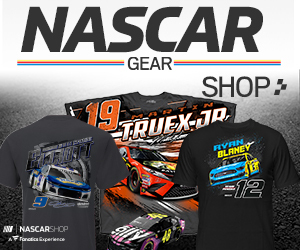 2017 Daytona 500 winner Kurt Busch overcame an early race pit road speeding penalty to finish second, Chase Elliott was third with polesitter Kevin Harvick and last years Talladega winner Ricky Stenhouse Jr. rounding out the top five. By Talladega standards the first Stage was relatively mild with patience the order of the day. Brad Keselowski would win that first stage with Logano second. The rather sedate affair ended on lap 71 when Erik Jones got loose and up into the wall exiting turn 2. The ensuing crash swept up a total of 6 cars including Jamie McMurray who had barrel rolled during practice on Friday and was in a backup car; Trevor Bayne, Aric Almirola, Kyle Larson and Martin Truex Jr. All but Bayne and Jones were able to continue initially, but Larson pitted and his crew went over the six-minute crash clock whil furiously trying to make repairs and he was sent to the garage. Paul Menard looked strong in the middle part of the race and won stage 2 with Logano again taking second. Logano would take the lead for the final time on lap 147 and was leading when the famous Talladega “Big One” erupted on lap 166. Although Johnson started the crash, he had only minor damage; most of the others had varying damage. Byron, Menard, Allmendinger and Keselowski were done for the day. The restart came on lap 171 with Logano leading. From there he held off challenges from Harvick, Kurt Busch, Elliott and Alex Bowman. Logano would not be denied, and the only last lap heroics came from Kurt Busch who made an attempt to grab the win exiting turn 4 as Logano blocked and won the 19th race of his career by .127 of a second. Ragan was sixth, Almirola seventh, Bowman eighth, Newman ninth and Daniel Suarez 10th. Kyle Busch, who was hoping to win his fourth consecutive race, but had quipped earlier in the weekend that he had a better chance of winning the lottery, finished 13th.